You know I love putting wine in allllll the things. Wine gummy bears, wine ice cream…..I just can’t get enough! 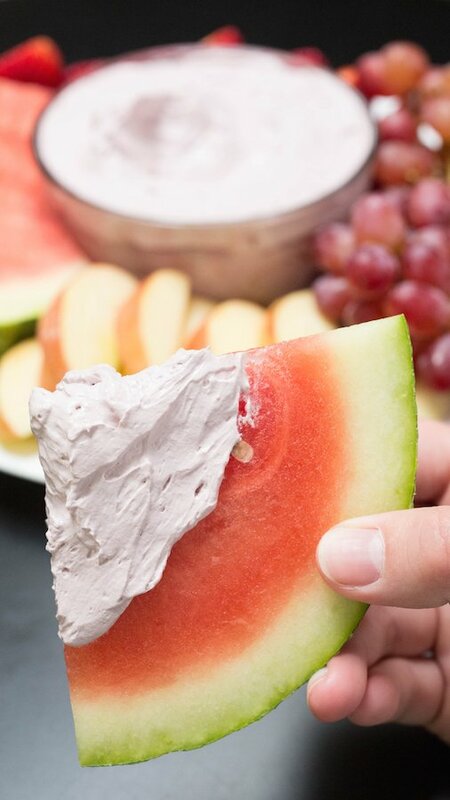 When thinking of a party appetizer that I could incorporate wine with, I decided on a fruit dip. Wine & fruit are a natural pair, so it sounded like a pretty good idea to me! Next to wine, my favorite thing to pair with fruit is, of course, cheese. Mascarpone is wonderful dessert “cheese” that seemed like it would make a great base. 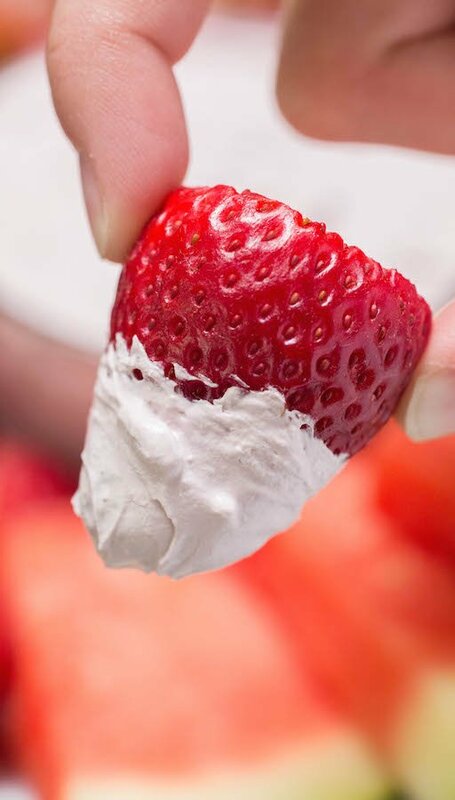 We all know that the key to a great fruit dip is a cool whip foundation, right? Right. So I threw a tub of that in there. A little vanilla bean never hurt anyone, so when I simmered the wine down to a syrup I added one of those to the pot. Totally optional, but I think it adds a little somethin’ somethin’. And that’s it! 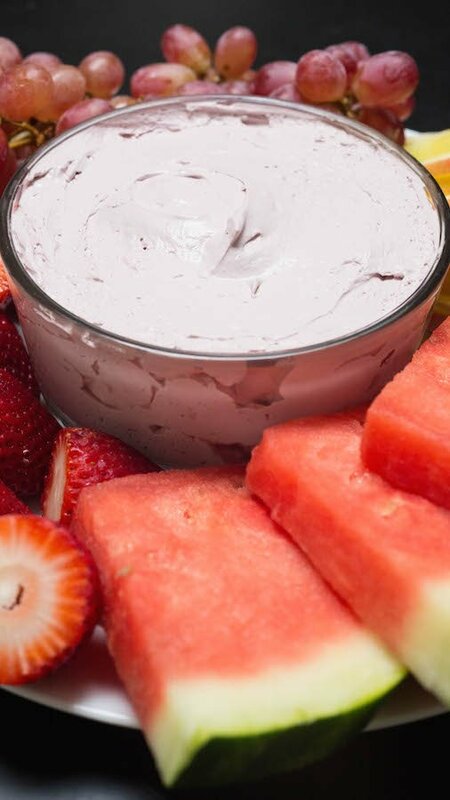 Just four simple ingredients to make this delicious red wine fruit dip. Literally anyone could put it together! Everyone seemed to have their own favorite fruit to dip in it. My favorite is the watermelon, but Janette is partial to the red grapes. We also really enjoyed it with apples and strawberries. You can’t go wrong, really. 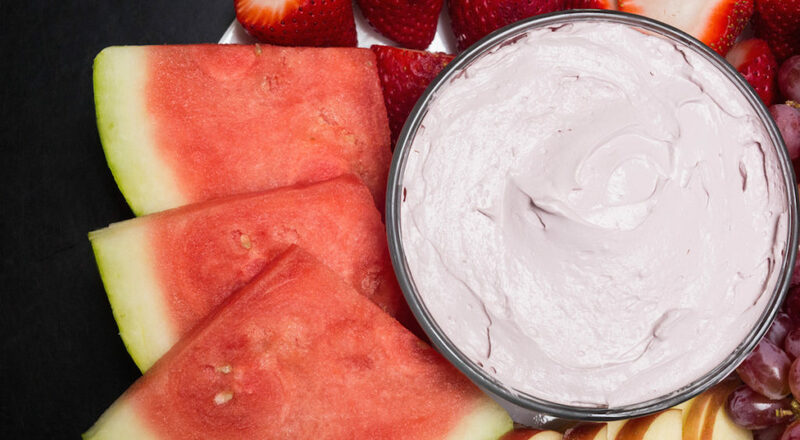 Get this red wine fruit dip recipe a gold record, ’cause it’s a certified hit! Add the half bottle of red wine to a saucepan. If using, also add the split vanilla bean to the pot. Bring to a simmer over medium heat. Allow to simmer until wine has been reduced to a syrup (should be around 1/4 cup of liquid). Remove from heat and allow to cool to room temperature. Remove the vanilla bean. In a large mixing bowl, add the mascarpone, cool whip, and red wine syrup. Use a hand mixer to blend until well combined. Store in an airtight container and store in the refrigerator until serving time.